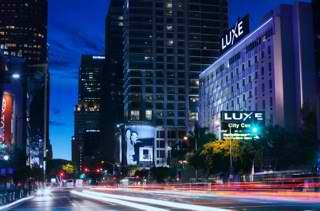 For those seeking a luxurious and accommodating hotel in the heart Los Angeles’ downtown sports, entertainment and business district, look no further than Luxe City Center Hotel. Mere steps away from a killer sports, showbiz and social scene, this unique boutique hotel is directly adjacent to the famed STAPLES Center, Nokia Theatre, world-class dining and other attractions located within the kinetic L.A. LIVE entertainment complex. Given its close proximity to the STAPLES Center, it’s no surprise the hotel’s Laker’s Experience Package—currently offered at $625 per game/night—is a draw. 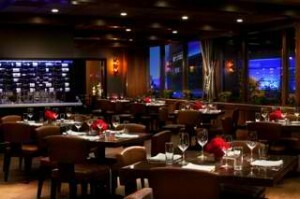 With this package guests receive two tickets to the Lakers game, Executive Suite accommodations, parking, two complimentary pre or post game cocktails with appetizer and a continental breakfast for two. 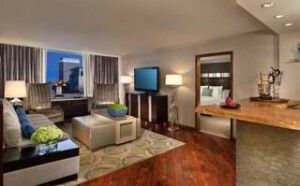 My own experience at Luxe City Center hotel was one replete with gracious service and sumptuous surroundings. I particularly loved the grand lobby with its shimmering nickel-plated Atlantis chandelier, trendy furnishings and décor that favored a modern and slightly art deco black, white and purple color palette. Of course, as with all properties in the Luxe Hotels family, a bowl of signature green apples is freely available at the reception desk, as are bottles of water that guests automatically receive upon check in. The stylish sensibility of the lobby area is carried throughout the property, from the on-site hotel restaurant, FigOly, to each the room options that include fourteen 375 square foot Executive Suites and two magnificent 765 square foot Platinum Suites. There is also a total of 162 Superior and Deluxe guestrooms available ranging from 300 to 380 square feet that, for the price point, are professedly among the largest and most luxurious in downtown Los Angeles. Each room or suite has upscale design details that include acacia hardwood floors, flat-screen televisions, and marble bathrooms that are outfitted with plush 100% terry cotton robes, ionic hair dryers, and rain-style shower heads. The Platinum Suites also have relaxing free-standing soaking tubs and digitally controlled Kohler multi-function shower heads among an array of other enhanced features. What I particularly love about Luxe City Center Hotel is that, no matter the room choice, all guests benefit from premier amenities such as complimentary high-speed Internet access throughout hotel, nightly turn-down service, premium in-room minibar, on-call spa treatments, full-time guest concierge, and a Keurig coffee brewing system. Bedding in all rooms boast a triple-sheeted Sealy double pillow top Presidential mattress topped with 100% goose down pillows. Hypo-allergenic bedding is available by request. When you’re ready to venture out and socialize, hit the second floor of the hotel where you’ll find a large outdoor terrace with chic private cabanas, copious table seating surrounded by outdoor heaters, cozy fire pits and a sculptured water fountain. 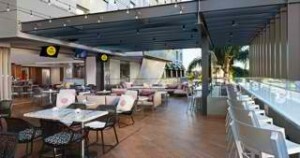 This cozy outdoor lounge area, which directly overlooks L.A. Live and the bustling street scene below, offers decidedly tasty small plates, artisan cocktails, adult shakes and craft beer. It’s a great place to start your day or night, or end it. And, to offset all that eating and imbibing, you can maintain your workout while you travel in the hotel’s third floor Fitness Suite where a few cardio machines are available. Guests also benefit from complimentary access to a local Gold’s Gym if a more serious workout is in order. Another distinctive feature of this luxury hotel is the fact that it’s pet friendly! Yes, it is one of the very few luxury hotels in Los Angeles that will welcome your four-footed best friend—as long as there are a maximum of two furry companions and both are under 30 pounds. The property will prepare for your pooch by setting up a plush pet bed, food and water bowls and even supply bone treats so pup feel spoiled, too. For those pet owners to hate to board animals in a facility or impose on friends or family for pet care, this amenity is priceless. In downtown Los Angeles, you will be hard-pressed to find a hotel that facilitates such a lavish and convenient Lakers game experience or travel experience in general—whether you are jaunting for business or pleasure, even with your pup in tow.